Rowan Fitzgerald. Photo submitted by SWNS. The family of a Leamington schoolboy who died in a bus crash have called for changes to the law to prevent a similar tragedy. Mr Chander was found unfit to stand trial at Birmingham Crown Court on medical grounds. But following a finding of the facts trial, to establish if the 80-year-old committed the offences, a jury found he did cause two deaths by dangerous driving. Jurors heard Chander made a “gross driver error” and displayed “shockingly bad driving” after he had worked three consecutive 75-hour weeks. In a statement, Rowan’s family said: “It is clear that both Kailash Chander and the management of Stagecoach Midlands are both fully responsible for the catastrophic events of October 3 2015. “We are sure that the dangerous driving that he did on the day of the collision was as a consequence of both his age and his fatigue. “Likewise for the management of Midland Red South (trading as Stagecoach Midlands) - to allow someone of that age and with such a poor employment record, to drive for such lengthy periods is total stupidity. “The court findings give us no satisfaction, no sentence would ever stop the hurt that we feel for the loss of Rowan. “However, we have real concerns that the deaths of Rowan and Dora will not be the last if laws are not reassessed and changed. “This is completely ridiculous that HGV drivers, who only carry goods and not people have tighter working regulations governed by tachographs, whereas it appears a 77-year-old carrying up to 70 people on a double decker bus is allowed to do ridiculously lengthy hours when suffering the early stages of dementia. “We don’t want the reasons why Rowan and Dora died to be forgotten, we want to see something positive come from this and at this time we feel this will only come from a change in law on bus drivers’ age and hours of work. Prosecutor Andrew Thomas QC said Mr Chander mistook the accelerator for the brake, glanced a nearby bus and then veered off the road onto a grass verge. Mrs Hancox was hit by the bus, as well as a falling lamp post, knocked down by the bus. The bus then hit Sainsbury’s, killing Rowan who was sat on the front seat on the top deck. The court heard Chander had a string of near misses before the crash but was still allowed to drive the bus. 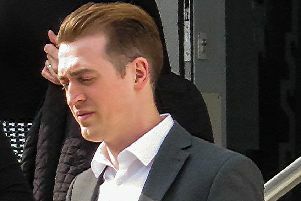 Between 2012 and October 3, 2015, he struck a piece of street furniture, reversed into another bus at the depot, caused a rear end collision with a car, and struck a gate as he was returning to the depot. Mr Chander could be given a supervision order at a further hearing on November 26. Midland Red, which faces an unlimited fine, will be sentenced on the same date.